Our commercial air conditioning service extends to repairing and installing all brands and types of units. With a team of experienced technicians, DESCO can make your air conditioning repair a quick and simple procedure. Our years of experience has allowed our staff to build up a vast amount of expertise. 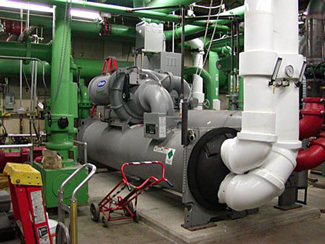 DESCO Services offers a multitude of commercial air conditioning installation and repair. Finding the right part to repair an air conditioning unit is never a problem at DESCO Services. We can provide any kind of repair regardless of the make and model of your commercial air conditioning unit. There are no brands we are limited to when it comes to commercial air conditioning repair or installation. Not only do we deliver the right parts, but we also deliver the right services. DESCO’s commercial air conditioning repair and installation is a comprehensive service in which we find a way to fix whatever problem is affecting your commercial unit. DESCO Services is committed to providing quality in every aspect of our business. That means finding you the best parts. It also means being able to repair and install every type of commercial cooling system on the market today. We stand behind the quality of our work with an ongoing commitment to being the best commercial HVAC repair team in the state of Pennsylvania. No need to worry if your commercial air conditioning stops working at your business. Help is always just a phone call away. Contact DESCO Services in York at 717-846-3384, Hanover at 717-637-2216 or Gettysburg at 717-337-3053 and we will send one of our trained experts directly to you. Day or night, we are here for you every single day of the year.